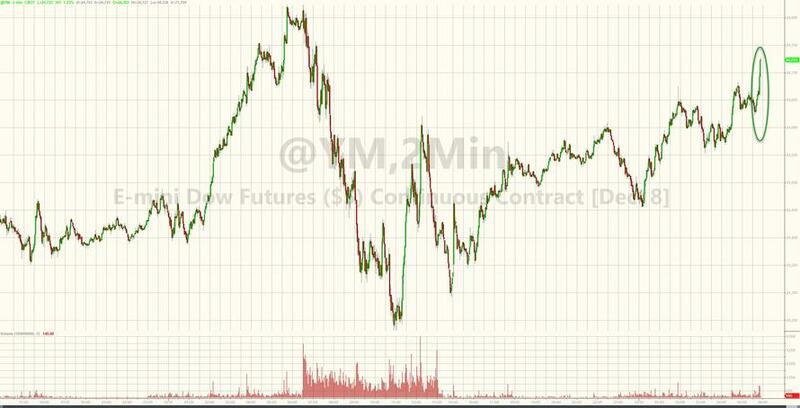 In Giant Trade War Concession, China Prepares To Replace "Made In China 2025"
Stocks futures exploded higher Wednesday morning following a report in the Wall Street Journal claiming that China is planning to increase access to its domestic market. If accurate, this would constitute a major concession in the trade war and address one of the Trump Administration's biggest complaints about the inherent unfairness and anti-competitiveness of China's "Made in China 2025" policy. China's top planning ministry is working on a replacement for "Made in China 2025" that would play down Chinese dominance in manufacturing and open the door to more competition from foreign firms. Current plans, these people said, call for rolling out the new policy early next year, a time when the U.S. and China are expected to be accelerating negotiations for a deal to end their bruising trade battle. One of the biggest concessions would be abandoning targets for domestic content for components, something that Chinese officials are likely considering for their own economic reasons - like mitigating waste and leading to better market returns - rather than doing it purely to appease Trump. A key concession under consideration would be dropping the numerical targets for market share by Chinese companies, these people said. Made in China 2025 sets defined goals of raising domestic content of core components and materials to 40% by 2020 and 70% by 2025, an increase that comes at the expense of foreign competitors. Chinese officials backing the proposed changes emphasize that China needs to move away from Made in China 2025 and state-led development for its own reasons. President Xi’s economic adviser, Vice Premier Liu He, and other senior officials have criticized Made in China 2025 for creating waste. Cheap loans made available by various levels of government, for example, have led to extreme overcapacity among electric-vehicle battery makers in the past couple of years, making the sector less viable. It's also worth noting that the decision to abandon "China 2025" isn't entirely unexpected. Chinese leaders in recent months have stopped mentioning the Made in China plan in public remarks. At a press conference last month, President Trump took credit for China shelving the plan, saying, "China got rid of their China ’25 because I found it very insulting." But rather than uncritically embracing the reforms, the Trump Administration will likely remain skeptical - at least at first - as WSJ reports that China likely won't go as far as the US would like, and some US officials might see the changes as "more cosmetic than real." The revision is also likely to be treated with skepticism in the U.S. Officials in the Trump administration have called Made in China 2025 a threat to fair competition, saying it encourages state subsidies for domestic companies and forces technology transfer from foreign partners. Some U.S. officials are likely to see the changes as more cosmetic than real. 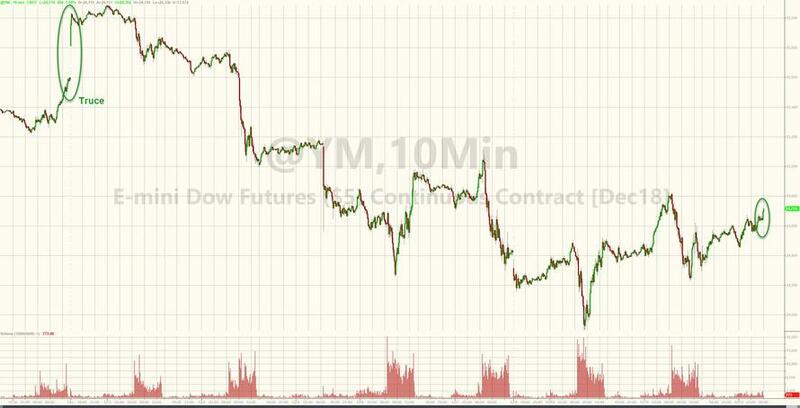 Stock futures climbed on the news as investors now have good reason to believe that Wednesday's session won't be a re-run of Tuesday. For context, stocks remain well below the post-G20 truce highs, so this WSJ rumor is not convincing everyone. And offshore yuan also moved higher as trade tensions eased. 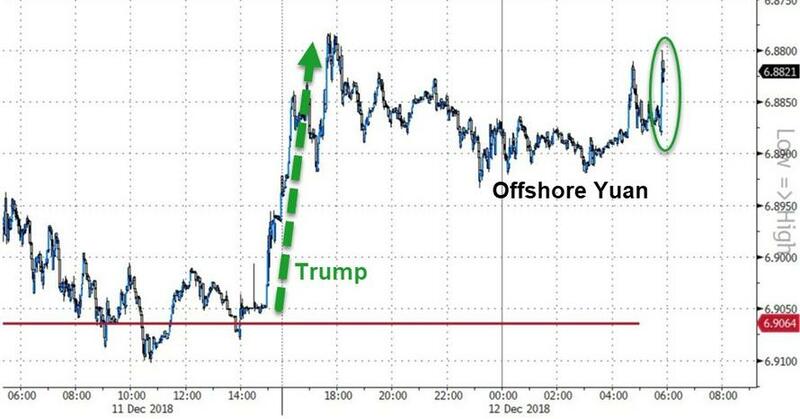 The WSJ report adds to a raft of market-positive trade-related news released over the past 16 hours, including President Trump saying during an interview with Reuters that he could intervene in the prosecution of Huawei CFO Meng Wanzhou (who was granted bail by a Canadian judge) as part of a trade pact with China. Trump also said he was ready to meet with President Xi again. Talks with Beijing are already making progress, and Trump stressed that he wouldn't move ahead with the next round of tariff escalations until he was sure about a deal. Yesterday, reports suggested that China was preparing to role back its punitive tariffs on US autos, but those were quickly overshadowed by a contentious White House meeting between Trump and Democratic Congressional leaders, as well as intensifying anxieties about Brexit.